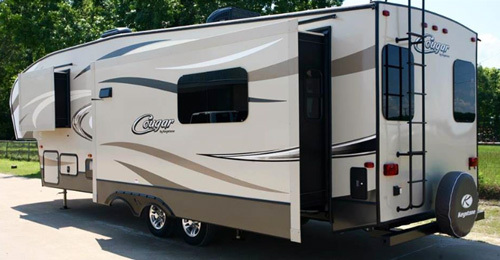 Keystone’s Cougar X-Lite 29RES is a mid-range fifth wheel camper designed for family of up to four (so basically typical family with two children). 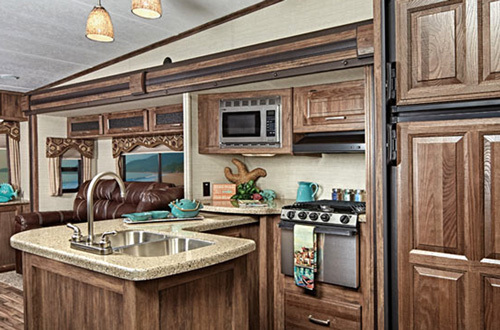 We selected it for this 2017 presentation due to functional layout, generous residential-like features, stylishness, affordable price, weight within towing range of popular full-size pickup trucks as well as known quality of Cougar’s craftsmanship. It does not mean that the X-Lite 29RES is an ideal camper, (actually there are also things we do not like about it) but frankly, there is no such camper, especially in this price range. Queen-size bed with “orthopedic” mattress offers all you need for comfortable sleeping. The only nightstand is on the right side of the bed (with handy USB/12V/110V outlets above if you need to charge your phone, iPad or plug the computer). On the left side of the bed there is a narrow wardrobe, but your main storage needs are offered by a slide-out wardrobe with room for hanging cloths. Both wardrobes come with mirror doors making the bedroom looking roomier than it really is. (well, it is not always about “how it is”, I many cases it is at least equally important “how it feels”). The TV prep offers possibility to install an optional TV if you are really “dying” to spoil your private quarters by some “soap-opera” (well, your choice). The reading lights invite for reading books just before falling asleep ….. The bedroom has private access to the bathroom which houses linen cabinet. Sliding door makes it effortless and does not take precious space. 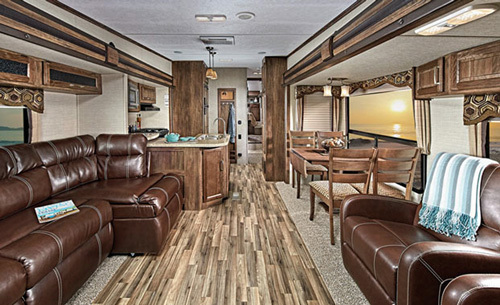 The carpeted floor offers softness and warmness you will appreciate when getting-up barefoot. 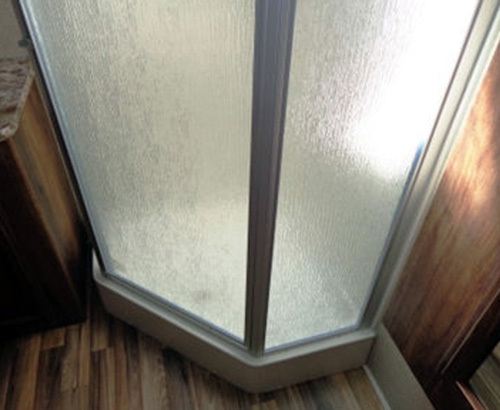 The center point is the glass-enclosed shower. Large, with skylight above, it provides enough of room for even “extreme” cases. The vanity offers large sink, solid-surface (Corian-like) countertop and cabinet for toiletry. 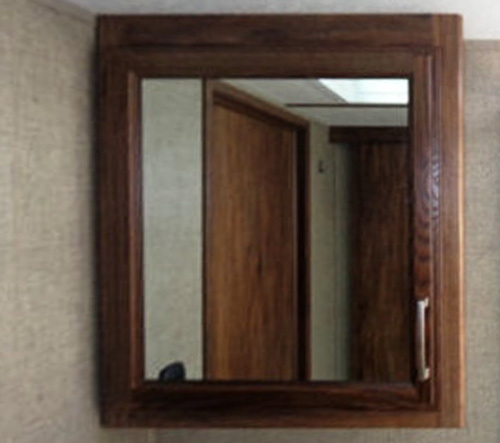 Large medicine cabinet with mirror hanging above will certainly satisfy most demanding owners. 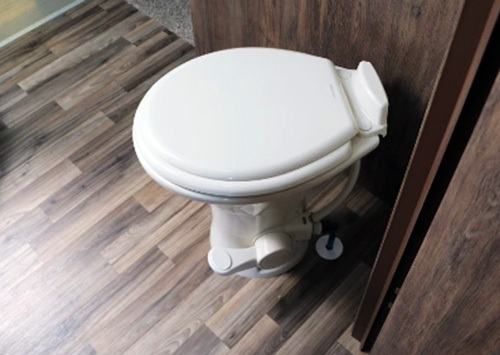 The porcelain toiled with pedal-flush is in the opposite corner between both entry doors (2nd door is leading to the narrow passage between the Master Bedroom and the central part of the camper). Most important – despite being generously equipped, the bathroom has still enough of room to move freely! The kitchen is located in one of two main slide-outs. It is “organized” in U-shape with L-shaped, “peninsula”-form cabinetry. The stainless-steel 3-burner stove with oven, microwave with turn-table and next to it fridge with freezer make to core of the kitchen appliances. 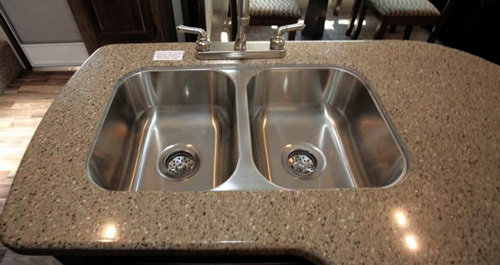 The Corian-type counter-tops with flush-mounted stainless-steel sink have the residential-like look. I guess it will be appreciated not only by those cooking but also by everybody in the living room. It’s because the kitchen and the living room share the common space. 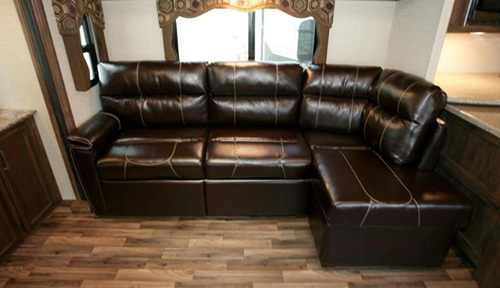 In other words the elegance and stylishness spreads over the camper and so warmness and charm. The hand-glazed hardwood cabinetry offers robust doors, drawers (steel-ball bearings guides) and enough of space for panes, pots… The large, under the sink storage cabinet can be used for everything else including the garbage bin! Similarly, the optional free-standing dining table with four chairs well matches the residential ambiance. It does not mean that standard dinette (table and two benches) make a strong contrast. It also nicely integrates into the living room ambiance. 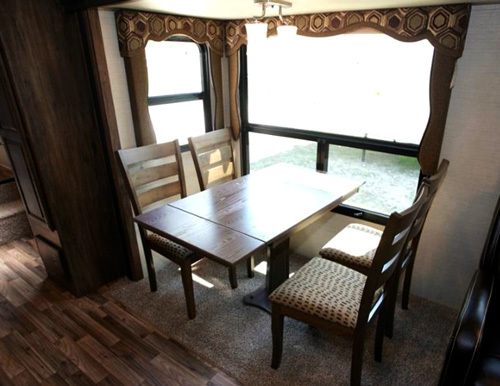 Advantage of the classic dinette – if needed it can be also converted into sleeping space. It may be worth to mention that the refrigerator/freezer is powered by either electricity or gas and the switching is automatic depending on the available source of energy. This takes away one headache to worry about. Somehow out of the U-shape kitchen stands the generous pantry. 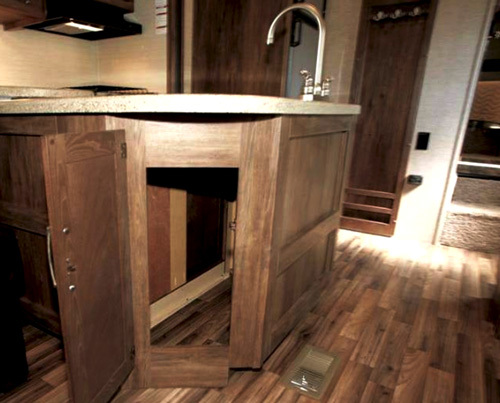 It is located on the opposite to the kitchen side of the camper, next to the entrance door. The nice accent – On the kitchen wall there is a recessed “hanging rack” where you can hang you jacket when coming from the outside, keep apron ready to use etc. There are also hangers for keys and very useful little pin-board. It’s located at the back of the camper including two opposite sides slide-outs. Both of them are shared with the central kitchen (one houses kitchen, the other one the dining table/dinette). The living room fulfills needs for relaxing, playing games, reading, watching TV, listening to the music, working (computer)…. Essential part of the “relaxing” environment is made by two recliners and sleeper-sofa (facing each other). Recliners can slightly turn to face a rear-wall Entertainment Center (if required, they can be replaced by optional Theater Seating for two). 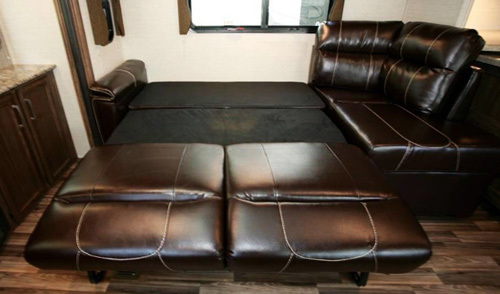 The sofa provides large storage box and can be unfolded to offer the comfortable sleeping space for two (presumably children or grandchildren, but nothing wrong with friends). The panoramic tinted windows around the living room make the area open, freely reaching to “surroundings” (hopefully the Mother Nature). Being tinted they also offer privacy, however if more is needed, blinds will do the job. The rear wall includes the 32” LEC TV and an extra along-the-wall cabinet with solid-surface shelf. Thanks to outlets (USB/12V/110V) you can feed here your devices (and gadgets if you cannot live without). The TV screen is mounted on a rotating bracket so its position can be adjusted according to the needs facing recliners, sofa, kitchen or all these locations at the same time. The Cougar 29RES in its basic (low cost) version may not have all you need. Usually it comes factory equipped with several packages like Convenience, Value and Camping in Style bringing the price to the range between $40k - $50k. 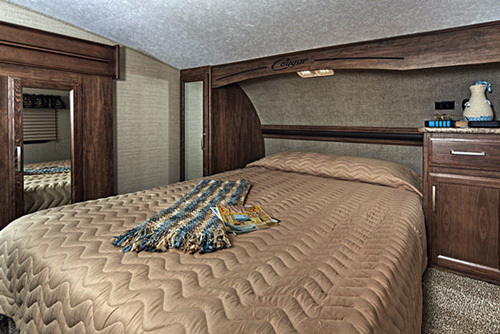 So frankly, in most cases the only package to consider when buying the 29RES Fifth Wheel is the Polar Package. 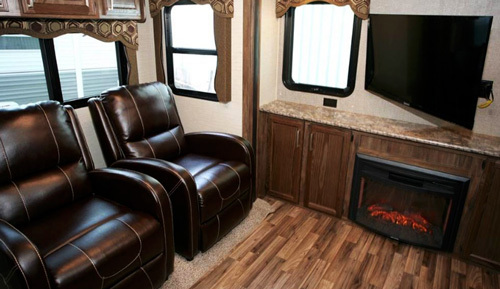 As the name suggests, it offers all-season camping opportunity, thanks to enclosed and heated underbelly. The list of individual options is short and its most interesting components are: Free-Standing Dinner Table w/chairs, Fireplace and eventually the Theater Seating (for most of us, the standard recliners will be more than enough). The Cougar 29RES has more storage than most of us will need. 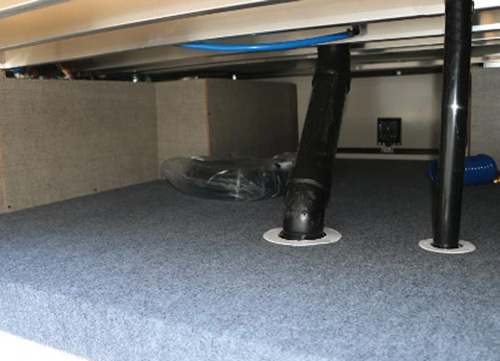 The under-bed storage (bedroom), sofa’s storage, overhead cabinets throughout the camper provide space for most of everyday stuff. However the largest storing space offers the front Pass-Through storage. 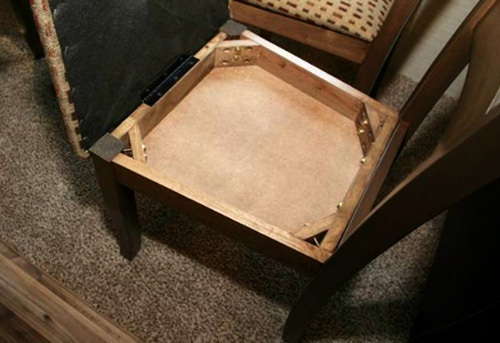 Thanks to 3rd front-door it is easy to load and unload any (usually “bulky”) stuff like camping chairs, table, bbq, and whatever you may need…. Thanks to slam-laches with magnetic locks, all external storage doors can be operated with just one hand. 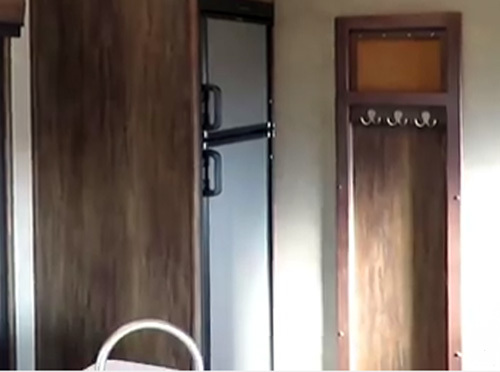 Talking about the doors – the entrance door is protected from slam-opening/closing and eventually smashing against camper’s sidewall by “Friction-Hinge” design. But here is a little dose of criticism addressed to camper’s designers. The two large grey/black water pipes in the middle of the pass-through storage and “hanging wire” are an example of poor engineering! They are clear obstruction to freely use the storage and are exposed to “danger” (mechanical damage) especially when we store here bulky, not always easy to handle items. 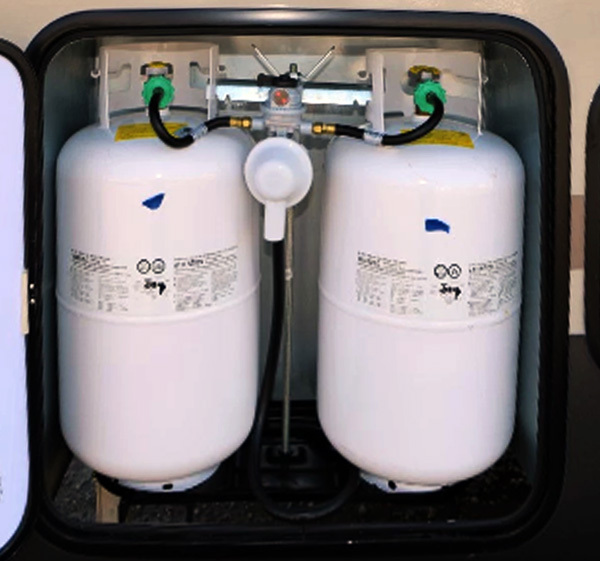 Please note that all essential elements of the camper’s “life-system” (LPG bottles, batteries, docking station) are hidden in dedicated, lockable and exterior-accessible storage areas. The power awning with LED lights is certainly the main feature offering outdoor living space. 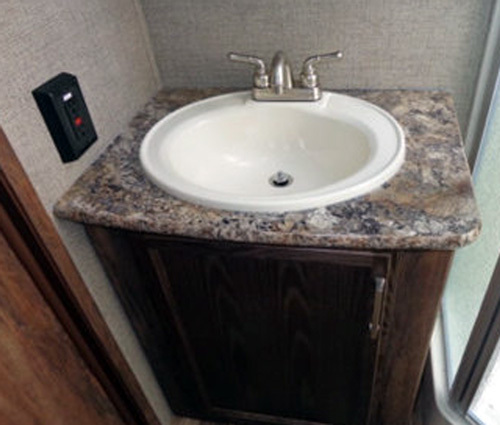 The exterior shower (hook-up in Docking Station w/hot/cold water) is also very useful (you save a lot of time and effort on cleaning the camper). Finally it is worth to note that the roof (accessible via rear ladder) is fully walkable and can be also used to carry with you some stuff (although it seems that the camper does not come with factory-installed rack). What about the rest of outdoor activities? It’s is up to your imagination, needs, abilities and obviously the available storage space. Those that tried to align the pickup-truck with camper’s hitch (especially in the darkness) know how difficult may be the process. 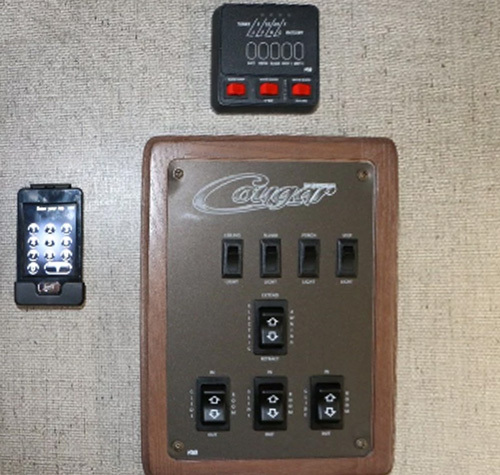 Cougar came up with very clever feature called: Hitch Vision. Shortly – it is a mirror with a LED light installed at a specific angle in camper’s front cup/ Thanks to it you can see in your truck’s rear mirror the whole hook-up (and alignment) process. Thanks to the light it will also provide priceless help in the darkness of the night. 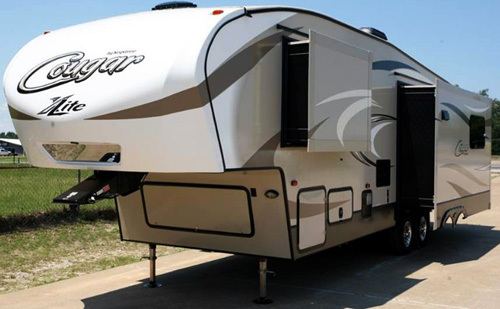 The Keystone-Cougar 29RES 5th wheel is designed as a modern ultra-lightweight camper. All aluminum or fiberglass construction on top of being lite and stylish also promises durability.